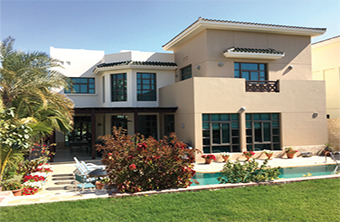 A FIVE-BEDROOM villa is available for sale in Riffa Views’ signature Park Estates boasting a lush green garden and a sizable swimming pool. The stylish home is situated on a large plot of 824 sq/m; all beautifully landscaped. The ground floor includes a guest bedroom with built-in wardrobes and an ensuite bathroom, a guest closet, a kitchen, a family room, a dining room and living area on the ground floor. The kitchen features an array of counter space, state-of-the-art appliances and a serving bar that opens up to the dining area. There is a storage room under the staircase along with a few cupboards nearby. The first floor is made up of a living room, a master bedroom and three guest rooms. All rooms come with built-in wardrobes and ensuite bathrooms. The master bedroom includes a dressing area and a small balcony. There is a lovely patio area in the backyard suitable for barbecues and outdoor dining. The maid’s room is located outside along with a second kitchen. There is also a double garage with electronic doors. Unlike Riffa Views’ Lagoon and Oasis estates, the Park is not set around the golf course offering more privacy and seclusion to investors and home-owners. Residents will still be able to enjoy the development’s facilities including its 18-hole Colin Montgomerie-designed championship course and the Mini Monty 9-hole executive golf course. Riffa Views also features a country club, an international school and the Riffa Palms shopping complex which includes a supermarket and restaurants.